Vertical lines drawn from the centre of buoyancy at small angles of heel will intersect at a point called the metacentre (M). The metacentre can be considered as being similar to a pivot point when a vessel is inclined at small angles of heel. The height of the metacentre is measured in metres from the reference point (K) and is therefore called KM. A vessel is in stable equilibrium if returns to the upright after being inclined. This only occurs if the centre of gravity (G) is below the metacentre (M). A stable vessel when upright is said to have a positive metacentric height (GM) when the metacentre (M) is found to be above the centre of gravity (G). It is also said that the vessel has a positive GM or a positive initial stability. 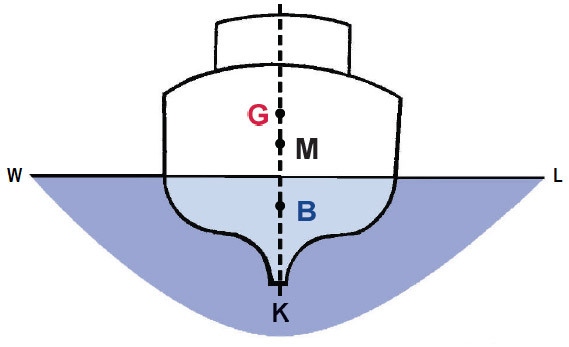 The distance between G and M is either called metacentric height or initial stability. 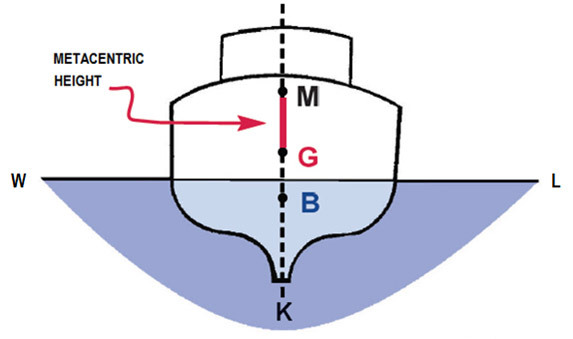 If the centre of gravity (G) of the vessel is above the metacentre (M) the vessel is said to have a negative GM or a negative initial stability. A vessel in this state has a loll, i.e. she floats at an angle from the upright to one side or the other and there is a danger that she may capsize. 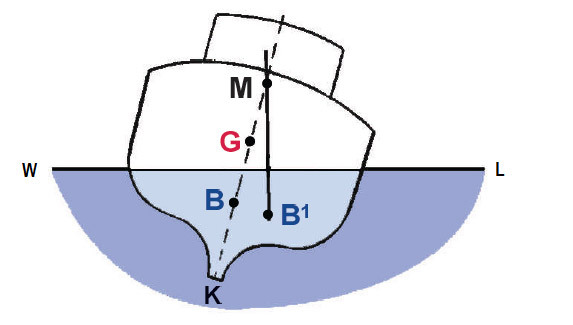 When weight is added to a vessel, the centre of gravity (G) of the vessel always moves in the direction of the added weight. 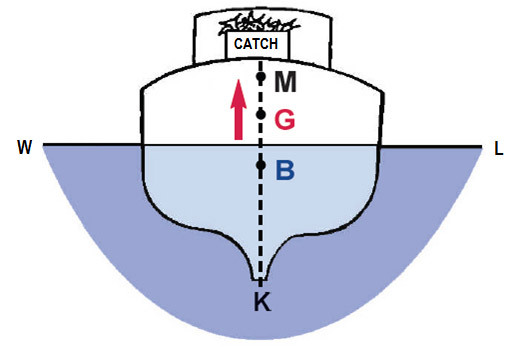 Weight added at the deck results in a rise of the vessel’s centre of gravity (G). That causes a decrease in the vessel’s metacentric height (GM) and thereby her stability. The time that it takes for a vessel with little metacentric height to roll from side to side is comparatively long and is said to be a TENDER VESSEL. Weight added low down in the vessel lowers the vessel’s centre of gravity (G). That causes an increase in the vessel’s metacentric height (GM) and thereby also an increase in her stability. The time that it takes for a vessel with large metacentric height to roll from side to side is comparatively short and is said to be a STIFF VESSEL. 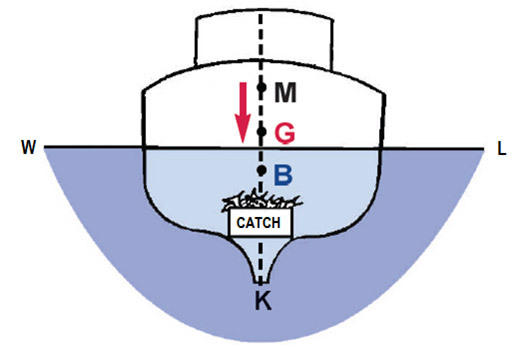 Heavy weights, such as catch and fishing apparatus, should not be situated at the deck, because the vessel’s centre of gravity (G) will rise and the metacentric height (GM) will decrease which will increase the likelihood of a capsize of the vessel. A stiff vessel tends to be comparatively difficult to heel and will roll from side to side very quickly. A tender vessel will be much easier to incline and will not tend to return quickly to the upright. The time period taken to roll from side to side will be comparatively long. This condition is not desirable, and it can be corrected by lowering the vessel’s centre of gravity (G ).